Hello everyone and welcome to another post. I'm really sorry for not posting any DIY posts for a while. I'm just having difficulties nowadays and I can't focus on my blog and social media. However, I have a good news for you guys, I'm going to get back on the track soon because I'm almost done with my work and assignments that made me lose focus. I thought I could take every day posting alone, but it seems so hard to do it because I got so many other things to do. Doing this made me really get a little bit disappointed and stressed from work and just thinking and trying to do every day a post. I decided to make a schedule throughout the week for posting which will help me with not only writing a post but also, working on sharing it. The schedule is inspired by my friend Dora(a shout-out for her) and it will be two days a week. I thought of good days for me and couldn't find better days than Monday and Thursday. I'm going to start following this schedule from today. I'm sure this will help a lot because I will get time to read other's blog posts which I've been trying to do from the last month. As we get closer to the end of each month, I get excited and hyped for the celebration day. This became the best day for me because it's not only for me but also, people who get to share their wins for the month will be exciting as well. Anyways, I got a good app today for people who love to keep their body in good fit and bring the gym to the house and not the entire gym like me. The best thing about this is that you don't need to spend much money for a good training. However, you will need to spend money if good training is not your goal because this stuff is simple and don't require anything. For example, you won't need any of the gym equipment if you use the app. If you want to build muscles then this won't really help a lot to be more accurate. I used to show the first thing shows up when opening the app which is the logo and the name. This time I'm going to skip to the second page which as you can see above, you need to create an account or link one of your social media accounts. The name of this app is 'Keep' which I'm assuming keep yourself in good shape with fitness and workout trainer. I'm sorry, I won't go through the steps how to make an account because I think it's not really interesting at all. 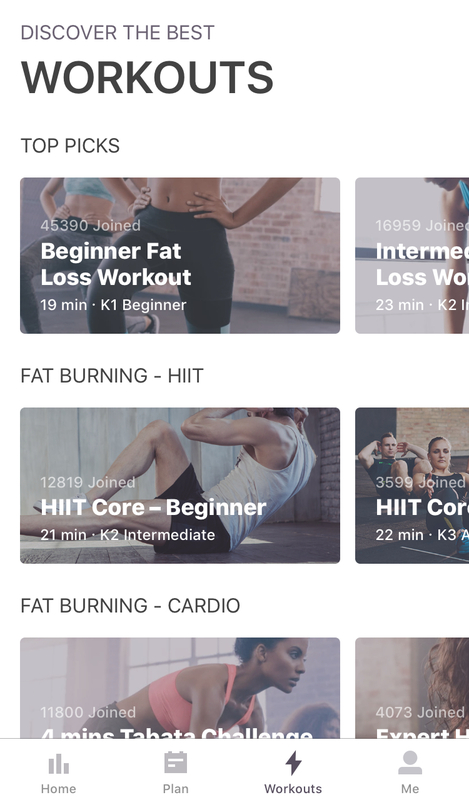 The app got so many workouts with a simple walk-through which will make it easy for everyone to use. It gets complicated if everything is not organized and it's going to be hard to find a good workout, but this app is organized and you can find all the workouts arranged in categories. For example, if you need fat burning exercises, it could be found in the fat burning category as shown in the picture above with specific selection. I love making plans for everything in my life and doing a plan for my workout is just another cool thing. You are allowed to set a plan for your workout and get a full week of training sessions with resting days as well. the app tells you when a rest day needed for your body which is amazing for everyone. The plan can go up to three weeks and you can choose whatever plan you want to follow and this depends on what's your purpose. If you are an apple user, you would know about the app 'Health' which helps users to track the health and heart beating. The app can be linked to it and give you accurate statistics about your training which can track everything for you including the training times. 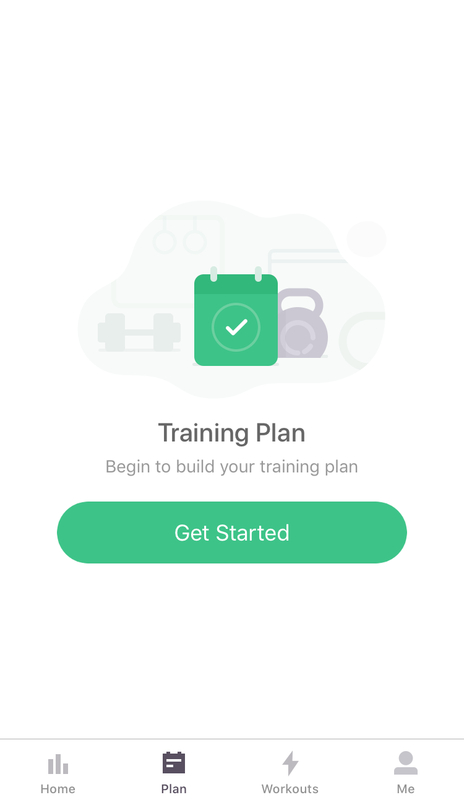 Also, you will be able to see the weekly insights of your training and steps. You will get exercises each day when you set a specific plan and You will follow them with a good walk-through. I'm not going through it because I want to leave it for you to go through it if you enjoyed it, you can download it from the app store by just searching 'keep'. This is the last thing I'm going to show off of this app and I would like to know your thoughts on it and what do you think of it!! Since you will create or link your social media account, you will get a profile on the app where you can save and edit your information in this app. There are many apps with the same thing and many people use different ones, which one you use mostly? comment below your answer! Awesome, thanks so much for the tips! This app actually looks like it could be useful for me. I prefer working out outside, but the weather in my neck of the woods doesn't permit most of the time. The next best thing is working out at home, but I get bored quickly. I think this app might be the shakeup I need. Thanks. Wow! This is really helps for my get my body fit. I love this idea!